The GOAT Roger Federer - thoughts from Majorfedfan: What in the world was that? 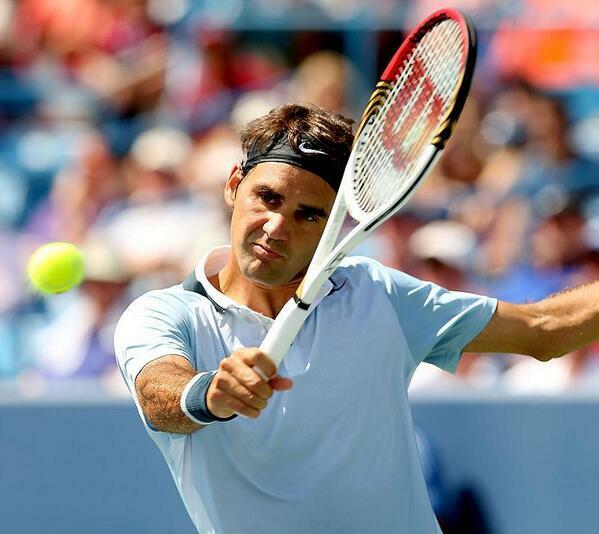 Today Roger Federer came back from the brink to beat Tommy Haas 1-6 7-5 6-3. After playing an awful first set (at least in my opinion, not his so much since he said he didn't think he was playing terrible) and then going down a quick break in the second I found myself feeling first of all very confused as to what the heck was going on, but also resigned to another early loss. The errors coming off his racquet were, simply speaking, just weird. He didn't seem fully "there" and as Darren Cahill said, he was making strange shot selection. To be honest if Tommy hadn't basically gifted the break back to him in the 2nd set I think the match would have been over before Roger could have even figured out what he needed to change. But everyone has the ability to get nervous and all of a sudden with a few errors by Haas he was back in the match. I think that gave him some confidence and he suddenly started playing like the real Roger Federer. I purposely didn't choose a victory picture to put on this post, but more a "figuring it out" one because that's really what he had to do in this match. He was interviewed by ESPN after the match and I was both puzzled and slightly amused that he said that he had a blast out there. Wow, was he playing a different match than what I was watching? It certainly didn't feel that way to me sitting on my couch watching, wondering and shaking my head. But the thing with tennis is that until the very last point you can always come back in a match, and maybe the enjoyment of being able to do that will propel him forward. As I am writing this the Nadal-Dimitrov match is getting ready to start. From what I have seen so far from Rafael Nadal lately it's hard to believe that Federer would be able to beat him at the level he is at right now. However, I would certainly not say it's impossible and my hope is that he will be able to take confidence from this comeback and somehow get a win in what will likely prove to be a very difficult quarterfinal.